MOSS HYSTERIA: Fair Trade Valentine's Day? Last week, I got the opportunity to have a blast from the past, with a touch of the future of trade. 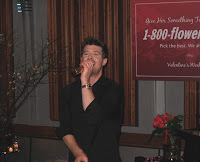 I heard that Robin Thicke was performing at an event that was showcasing romantic options from 1-800-flowers, so I called his aunt, one of my best friends, to see about getting in. It seemed like a billion years ago that she and I were watching 11 year-old Robin run around the pool in baggy swim trunks and torturing his older brother, Brennan. He was a funny and good looking kid, and charming even then. His performance was great, everyone was listening attentively, he was terrific with the press, and it was good to see some things haven't changed - like the looks and the charisma! And it was good to see some things HAVE changed. I was pretty impressed that, always looking for the green angle (okay, some would say I'm always looking for ANY angle), I asked the spokesperson for 1-800-flowers what eco-oriented strides they have taken. She did not miss a beat. She was well-informed about the options for fair-trade flowers that were offered, for example. Granted, they may not have taken the biggest strides -- and I think she agreed, but if you know Moss Appeal Green's position then you know I believe in starting SOMEWHERE. You also know I think that greening any company starts from the inside out, so to have the employees have the scoop was a good sign to me. 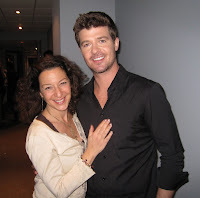 And even if she was a publicist, I got the sense, from the also charismatic CEO Jim McCann to Dir of PR Yanique Woodall, that a lot of the staff was informed about the company's efforts. That's what helps put more green in play...a company environment of support and interest that encourages employees to take it further and push the agenda. But it's time to stride faster down the sustainability path. 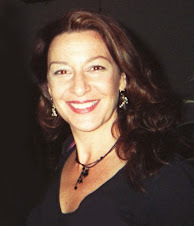 In her blog, "Dirt", Amy Stewart did a good job of posting considerations for florists making more impactful changes. And that was posted in 2007. I didn't have the opportunity to ask Jim if they have made deeper changes, like even water and energy conservation tactics in their 15 owned stores. I do know there are only about a dozen items that come up as "organic" or "fair trade" or "natural" of the myriad gift baskets or arrangements available on their site, and of those I have no idea what the packaging is like. With all of the moving parts of a big company like 1-800-flowers (they own everything from Harry London Chocolates to The Popcorn Factory, where nothing comes up under green but the Green Bay Packers logo'd popcorn tin) it's daunting to think of how much COULD be done -- from pressuring stakeholders to comply, to taking a deep breath and adjusting your profit margin and mandating tougher changes. We will be listening attentively when the publicist announces those kinds of changes.